By Dang U. Koe, ASP Chairman Emeritus. Many parenting experts have long spoken of the ills of exposing children to too much electronic visual stimuli — like television and computers. But progressive education proponents are also challenging today’s parents to open their minds to the possibility that the next generation will face a school environment very different from ours. The learning environment of the future will be enriched with integrated photos and video teaching aides, instant access to latest research and interaction across vast distances. Mona Magno-Veluz (@mightymagulang), ASP National Secretary, returns as this week’s Angel Talker. The unique challenges of individuals in the autism spectrum have given software and platform developers an opportunity to use technology to address the difficulties our ASD learners face. Mobile Apps. A quick visit to the Apple App Store or the Android marketplace will give you many free and paid options for applications that can help a child with autism. Aside from picture-text apps that help language learning, the online application market is packed with student and teacher tools for behavior-tracking, conversation coaching, social stories development, listening therapy, observation recording, among others. Autism Speaks maintains a recommendations page on learner-tested applications. Motion-controlled Gadgets. Games and learning software which responds to movement has been made possible by Ninendo Wii, Playstation Move and Microsoft Xbox Kinect. Many therapy centers all over the world have begun using these game platforms as tools in motor skills development for children on the spectrum. A team of students from De La Salle-College of St. Benilde recently bagged first place in the Microsoft Philippines’ Imagine Cup 2012 for their software development project, KidCAMP, a Kinect-driven web and mobile application developed for PWA learners that provides communications and teaching tools, assists teachers in creating learning materials, and monitors student performance. 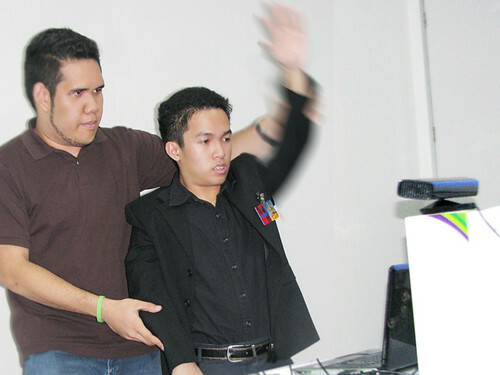 Kinect motion sensors in a recent demo of Pinoy-made KidCAMP at the Microsoft office in Makati. Digital Talking Books. The Autism Society Philippines, in cooperation with AusAid, is set to develop a series of DAISY (Digital Accessible Information System) digital talking books intended to teach children their human rights as individuals with disabilities, proclaimed by the United Nations. The project will feature social stories and will be illustrated by graphic designer Gabriel Atienza, a person with Asperger Syndrome. Social Media. Setting aside the global debate on how much social media children should be exposed to, the various online platforms like Facebook and YouTube, have provided individuals with autism a medium to communicate with the outside world from the comfort of familiar surroundings. Budding entrepreneurs, like PWA Carl Veluz, uses Facebook to talk to friends as well as gain orders for his gift-item business. PWA performers like Tumtum Mendoza, the ASP Dreamgirls and the Sparkle Band have used YouTube as a means to inspire and to show the world what talent and hard work can accomplish. Critical to the mix, of course, is a guiding hand to keep sensitive personal information away from the general public. All these software, web platforms and gadgetry are far from being the all-encompassing answer to the difficulties faced by individuals with autism. But they are undeniably becoming powerful tools that can help our children navigate what will be a technology-driven future. The Autism Society Philippines is embracing the call of digital technology! Aside from reading our blog, get updated on Facebook and Twitter (@autismphils), watch our YouTube channel, shop at our Multiply Store; and very soon, interact with us via an Internet radio program. If you have questions, talk to me on Twitter @dangkoe. This article appeared in the print and on-line versions of the Manila Bulletin on 02 July 2012.